Powers/Abilities: Ral Dorn is a dragon rider, and has trained all his life to care for dragons of all sorts, even the android Dragon Man. Dorn formed a symbiotic bond with the Dragon Man, so that the Dragon Man would obey his directions. Through concentration, Dorn and the Dragon Man can propel themselves through time and space into other dimensions. Dorn is also immune to fire. Dorn also wields a Dragonstaff, a thin bar which can expand to great length, growing barbs along its length. The Dragonstaff can absorb fire, and release it at a later point. History: (Fantastic Four Annual#16 (fb))- Ral Dorn was the second human to train to become a Dragon Rider, after his father, who had been lost on a mission. He trained side-by-side with his friend Lalique under the Hudaks, and learnt how to care for the dragons kept in the Dragon Pens. At last, Dorn and Lalique were accepted as Dragon Riders, but were told by the Hudaks that they would have no dragons. Dorn could not understand this, and stormed off angrily to the Dragon Pens. At the pens, he found all of the dragons dead, poisoned. Arriving people assumed that Dorn was guilty of poisoning them, and he went on the run. The Dragon Lord Skagerackrakor opposed Dorn, but Dorn fought him, and gravely injured the left side of his face. Dorn escaped to earth with Lalique, and hoped to locate the android Dragon Man, so that he could make him his own dragon steed. (Fantastic Four Annual#16)- Pursued by the Dragon Riders, Dragon Lord set off to the college campus where Dragon Man was first built. Wounded by the Dragon Riders, he found the Thing, who sent him to a hospital. (Fantastic Four Annual#16 (fb))- In the hospital, Dorn was visited by Lalique, who healed his injuries. However, Lalique no longer believed in Dorn's innocence, and left him to rejoin the Dragon Riders. (Fantastic Four Annual#16)- Dorn set off to the Baxter Building to ask the Fantastic Four for help, but was mistaken for an enemy by the Human Torch. He absorbed the Torch's flame to defend himself, but as a result, the Torch fell from the sky, but was then saved by Lalique. Dorn managed to convince the Thing of his innocence, and the Fantastic Four assisted him against the Dragon Riders, who were driven off. He then related his past to them, and stated his desire to find the Dragon Man. The Fantastic Four agreed to assist him. Comments: Created by Ed Hannigan and Steve Ditko. The end of Fantastic Four Annual#16 asked readers to write in if they liked Dragon Lord. Guess what? Never seen again. 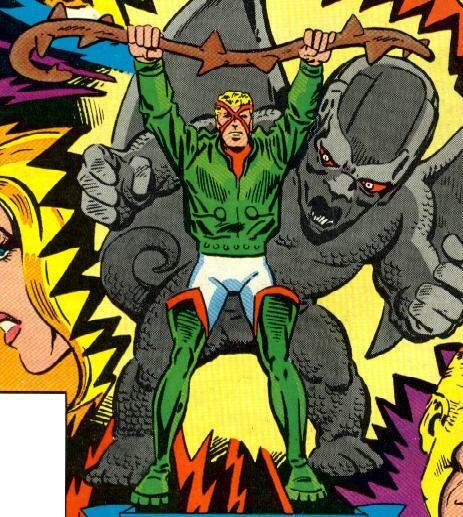 The Dragon Man next appeared in Incredible Hulk II#292, no longer Dragon Lord's steed.